A number of museums and exhibition places in Europe have collections of luminescent minerals. 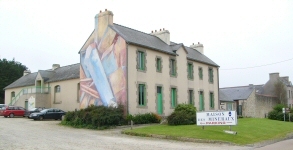 Probably the best fluorescent minerals display in Europe is situated in "La maison des minéraux"; in the village of Crozon in Brittany (France). This is probably the finest display of fluorescent minerals that can be seen in Europe. You will find some pictures of their exhibition here. If you plan to visit this place, here is the official website of the "La maison des minéraux" in Crozon. .
A permanent exhibition of beautiful fluorescent minerals can also be seen at the Natural History Museum in Lausanne.. You enter a short dark tunnel which allows to observe at the left and at the right two beautiful displaycases and you literally walk on a glass floor that serves as a third case. The Royal Museum of Natural History in Brussels, famous for its collection of iguanodon from Bernissart also includes a showcase of fluorescent minerals. Located in the Freudenstein Castle, in Freiberg (Germany) the Terra Mineralia is one of the biggest mineral exhibitions of the world with 3500 minerals, precious stones and meteorites on show – even fluorescing ones in an extra darkroom. 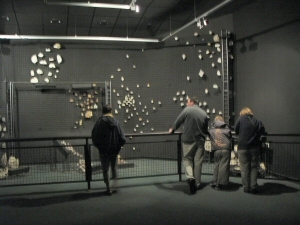 On 1.500 qm² visitors can explore the amazing variety of colours and shapes of minerals all around the world. Besides fascinating excursions provide explanations about the formation of minerals and how they determine everyday life and influence our culture and technology.